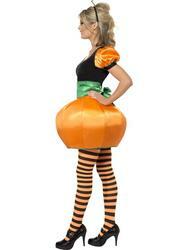 Our whole patch of Ladies Pumpkin Fancy Dress Costumes make a colourful costume idea for Halloween, a striking vibrant shade of orange to have your standing amongst the ghosts and ghouls that roam your street in style. From sweet to scary, the Halloween famous vegetable will help frighten off the evil spirits and have you look carved, cute and ready to party with minimal ease. We stock a fantastic range, from a pumpkin princess to an inflatable pumpkin outfit to get you joining in on the monster mash whilst looking outrageously good. 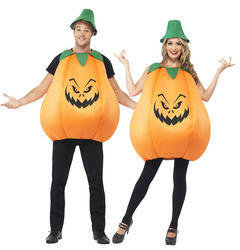 Pumpkins are a unique Halloween costume idea hugely popular amongst Ladies and can be worn alongside others to create a whole Pumpkin patch! 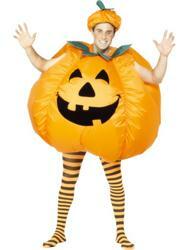 We stock some of the most superb Pumpkin costumes, guaranteed to get you looking absolute delicious at your next Halloween fancy dress party. So bring one of our pumpkin costumes to life and transform into one of the best looking walking talking vegetables youve ever seen this 31st October.